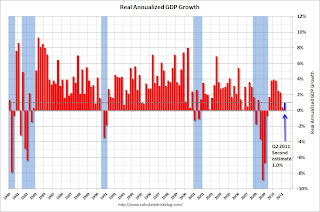 Real gross domestic product — the output of goods and services produced by labor and property located in the United States — increased at an annual rate of 1.0 percent in the second quarter of 2011, (that is, from the first quarter to the second quarter), according to the “second” estimate released by the Bureau of Economic Analysis. This was revised down from 1.3% and slightly below the consensus of 1.1%. Exports subtracted more from GDP – as did changes in private inventories. Consumption of services and fixed investment were revised up slightly. The following graph shows the quarterly GDP growth (at an annual rate) for the last 30 years. The current quarter is in blue. The dashed line is the current growth rate. Growth in Q2 at 1.0% annualized was below trend growth (around 3%) – and very weak for a recovery, especially with all the slack in the system. Calculated Risk goes on to report on the breakdown of what sectors accounted for what part of the growth (or absence of growth). The two most significant negatives were Personal Consumption of Goods and State/Local Government Spending. Both contracted sharply and each had the effect of lowering the GDP growth rate by 0.34 points. A 1.0% annualized growth rate is really not good at all. It’s horrible in fact. And that means it’s not the time to be cutting state and local government spending. The federal government really could do something but there’s no political will in Washington.